There are several important King Lists that provide details of Ancient Egypt's Pharaohs. The Palermo Stone is one of the most important historical sources for the Early Dynastic Period and the Old Kingdom. It is a piece of black basalt carrying on both sides scenes commemorating the most outstanding events under the reigns of Egyptian Pharaohs from the Archaic Period to the end of Dynasty V or VI. The last king whose name appears on the stone is Neferirkare Kakai, the third ruler of Dynasty V.
The largest piece has ben kept in the collection of the Palermo Archeological Museum, Sicily, since 1877, other pieces can be found in the Egyptian Museum, Cairo, and the Petrie Museum, London. The original is believed to have been about 2.2 m long, 0.61 m wide and 6.5 cm thick, but most of it its now missing, and there is no surviving information about its provenance. Still in situ on the walls of the corridor in the Hall of Ancestors at the temple of Abydos of Seti I (1291-1278BC). It shows Seti with his young son, the future Ramesses II, before a list of cartouches of 76 kings running from the first king to Seti I. Unacceptable predecessors such as Hatshepsut, Akhenaten, Smenkhkare, Tutankhamun and Ay, as well as pharaohs from the Amarna period are omitted. The list does not include any pharaohs from the Second Intermediate Period. 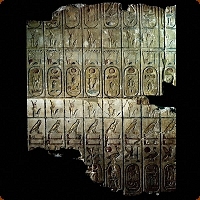 A badly damaged duplicate of the Royal List of Abydos, arranged in three rows, was found in a nearby temple of Rammesses II, and is now in the British Museum. This list, now in the Louvre, Paris, provides a list of kings from the first pharaoh to Tuthmosis II (1504-1450BC). It records many of the names of obscure pharaohs from the Second Intermediate Period (Dynasties 13-17). Discovered in the tomb of the Royal Scribe, Thunery, at Saqqara in 1861. Orginally the list had 58 cartouches, but now only 47 remain, running from Anedjib of the 1st Dynasty to Ramesses II and once again omitting names of pharaohs from the Second Intermediate Period. The papyrus is the best surviving chronology of the Ancient Egyptian pharaohs, but unfortunately is the most damaged. Originally listing over 300 kings, it was written around 1200BC. It lists the Dynasties of the Kings with the length of reign in years, months and days. Originally in the collection of the King of Sardinia, the brittle and crumbling 3000 year old papyrus was sent in a box, without packing, to its present home in the Museum of Turin. It arrived broken into countless fragments and what should have been a premier source for Egyptian chronology is a nightmare jigsaw puzzle. Scholars were obliged to work for years painstakingly piecing together and making sense of what remained, netherthe less, more than half of the contents proved impossible to reconstruct.